Deborah Meier – Returning Champion! 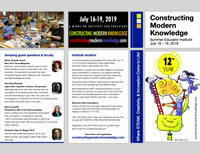 MacArthur “Genius” Fellow and veteran school reformer, Deborah Meier, returns to Constructing Modern Knowledge 2013 for the third time! Meier has spent more than four decades working in public education as a teacher, writer and public advocate. She began her teaching career as a kindergarten and headstart teacher in Chicago, Philadelphia and New York City schools. She was the founder and teacher-director of a network of highly successful public elementary schools in East Harlem. In 1985 she founded Central Park East Secondary School, a New York City public high school in which more than 90% of the entering students went on to college, mostly to 4-year schools. During this period she founded a local Coalition center, which networked approximately fifty small Coalition-style K-12 schools in the city. Her books, The Power of Their Ideas, Lessons to America from a Small School in Harlem (1995), Will Standards Save Public Education (2000), In Schools We Trust (2002), Keeping School, with Ted and Nancy Sizer (2004), Many Children Left Behind (2004), Playing for Keeps: Life and Learning on a Public School Playground (2010) and are all published by Beacon Press. Ms. Meier’s weekly blog, Bridging Differences, a collaboration with Diane Ravitch and now Pedro Noguera, is a must-read for educators and those serious about the future of American democracy.